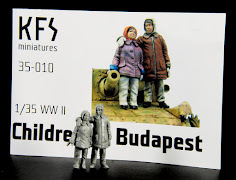 Reviewed here: 3 sets..Two singles and a pair together. 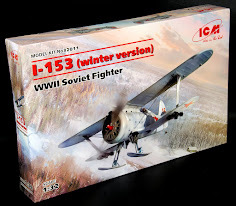 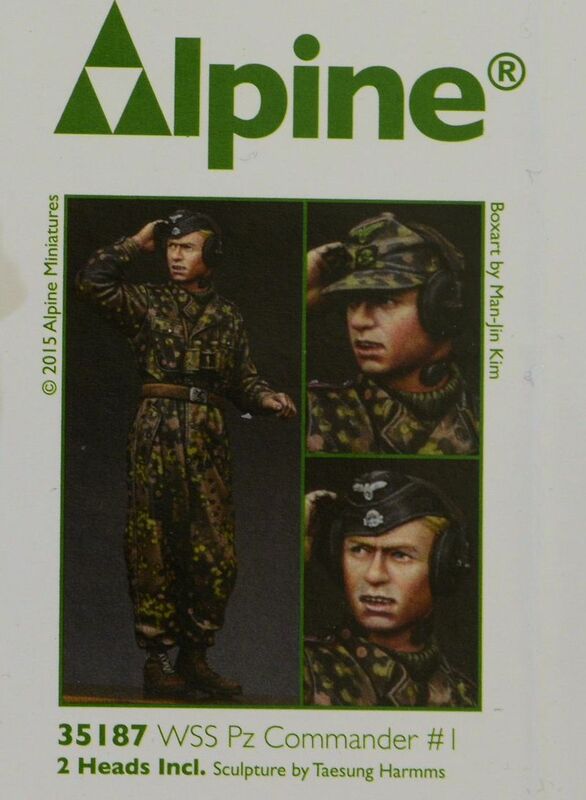 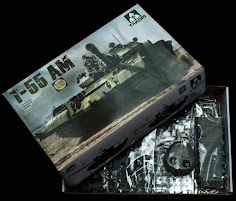 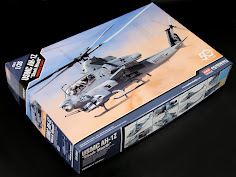 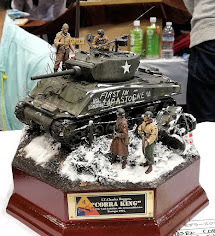 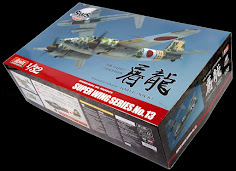 Alpine Miniatures has a great reputation in the military modelling business, as one of if not the best model making company producing figures in 35th scale (and 16th as well) today. 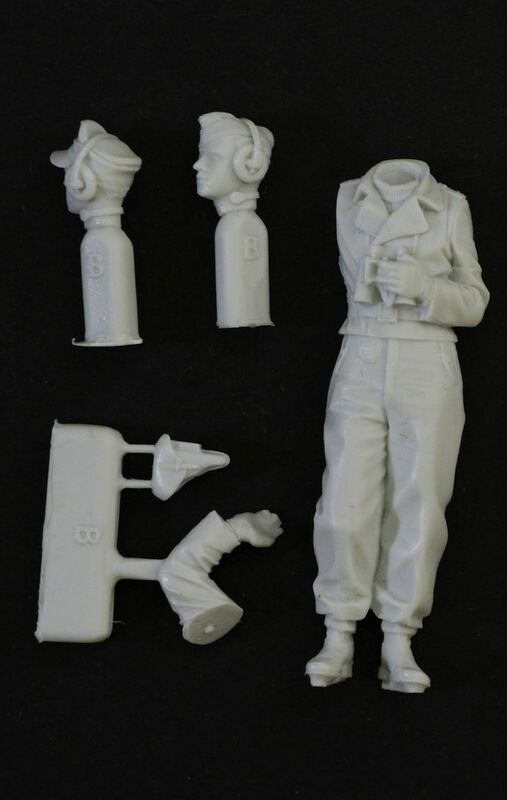 Their quality control and engineering with fine sculpting and casting work seem to have them churning out great figures one after another. 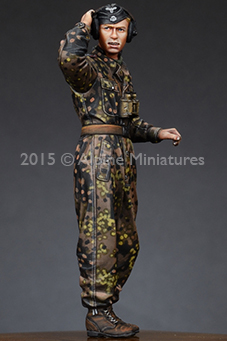 We are very excited to see their new figures when they arrive and to compare them to their past efforts. 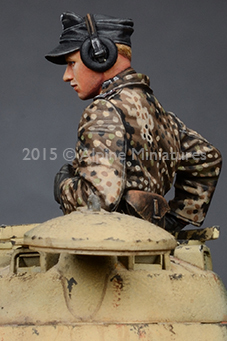 We are hard markers on their stuff because they themselves have set the bar so high. 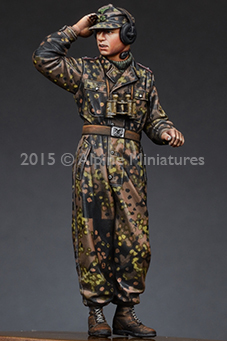 This new twin single release and dual set of SS Panzer commanders in WWII feature the usual option of two different heads for each figure, secured in a zip loc bag in their eye catching green plastic box. 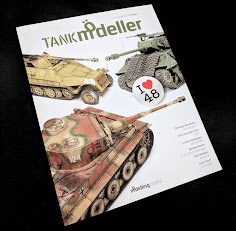 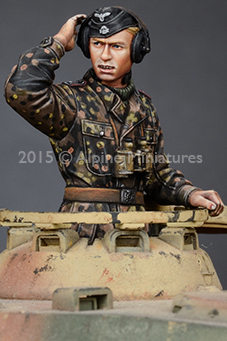 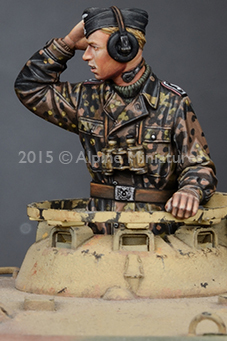 Some people will say “not another German Panzer set” – but the fact is these seem to sell the best out of most genres so for those who want to see another set of tank commanders then read on. 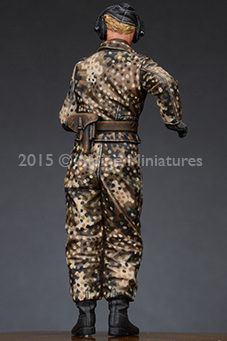 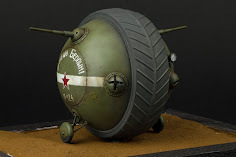 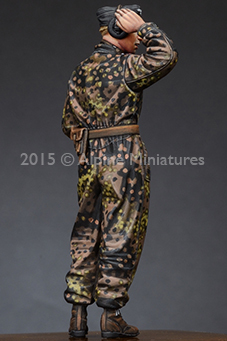 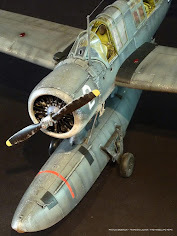 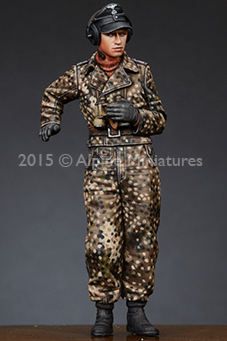 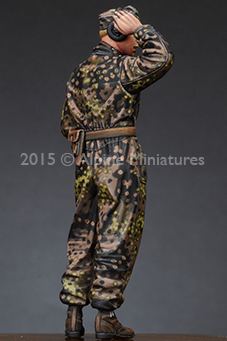 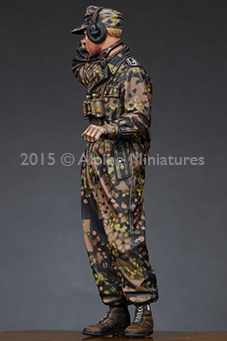 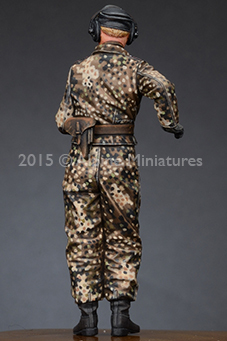 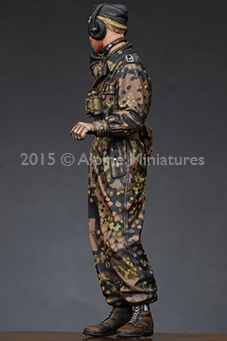 These two 1/35th scale figures feature full bodies clad in head to toe spotted camouflage. 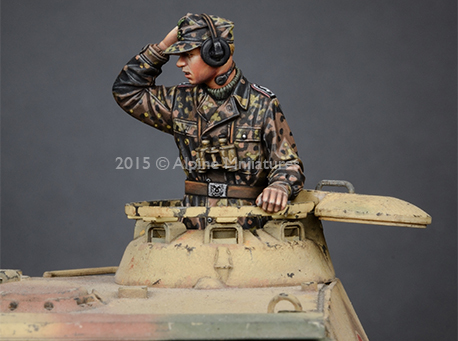 Only the headgear is the traditional tanker’s black. 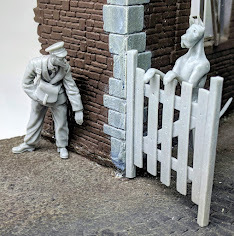 Man Kin Jm has done some great box art painting which we will look at after the review that really has done these figures justice. 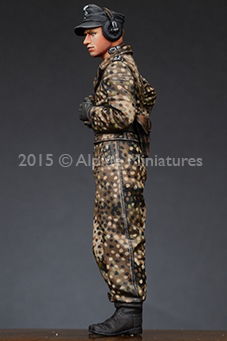 But for now we are looking at the two zip loc bags that make these to commanders. 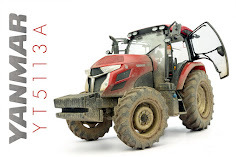 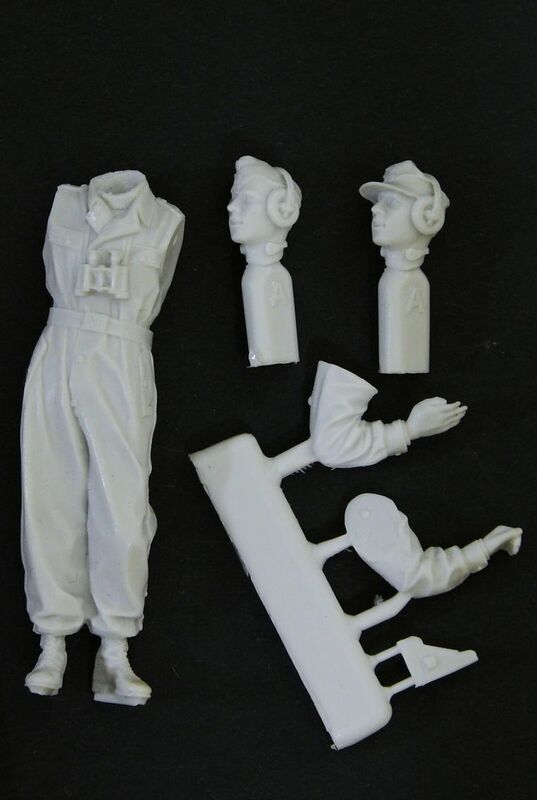 The light grey resin is well cast in that it is bubble free on the surface, it is really very finely detailed (which we will see later) and there are no real seam lines to worry about like on injection moulded figures. 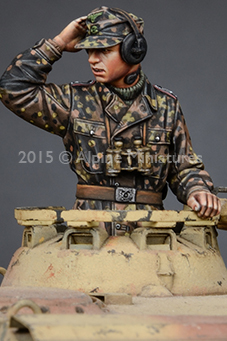 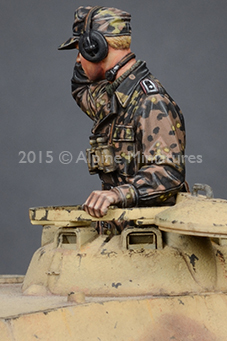 This SS Panzer commander in the set is similar but not the same as his companion in the set. 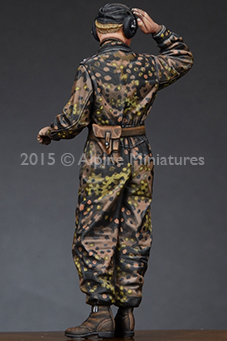 In what looks like an oak leaf camo he is seen not in overalls but SS camo Tank crew Coveralls with the pants tucked into his lace-less older style issued boots. 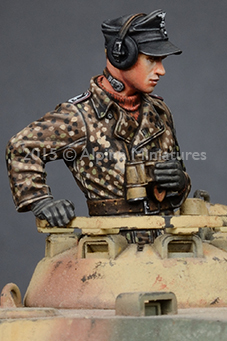 The gloves this panzerman is wearing hint at a colder climate as does the high roll neck the commander is wearing. 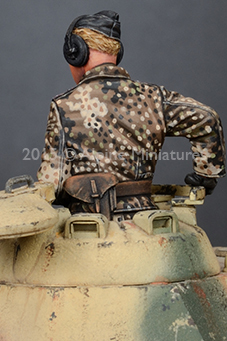 Like his comrade commander he also sports a Walther P38 pistol in its holster on his right hip (these small pistols were favoured by tankers who had to get in and out of hatches and crawl around inside AFV’s a lot), it sits on a notch which fits neatly into the rear left hand side of the double pronged M-34 belt. 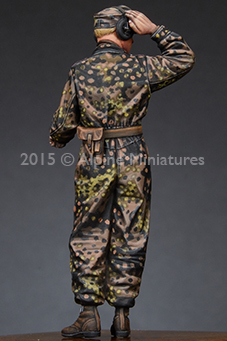 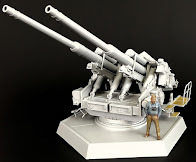 - this is great for keeping the pistol ON the figure and giving it some purchase on the kit - while some binoculars around his neck are all he wears on his front torso. 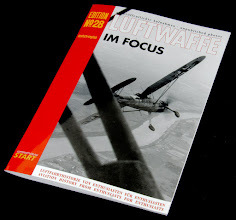 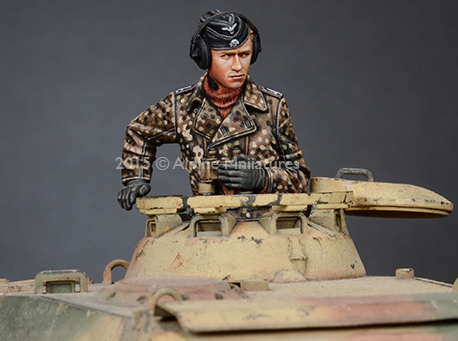 There are again two head choices for this soldier – the peak-less Feldmütze in panzer black with again the SS death’s head emblem and a German eagle on the front. 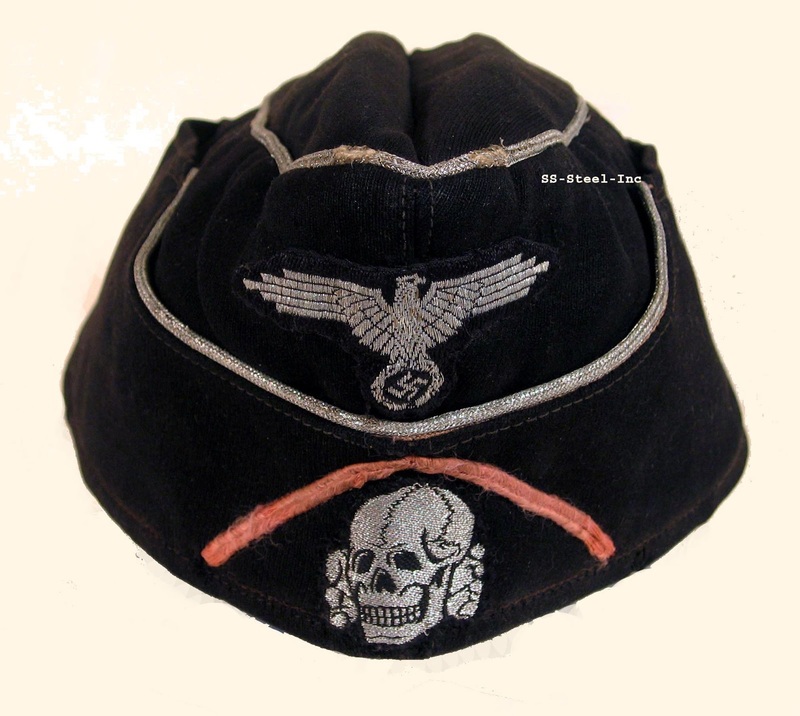 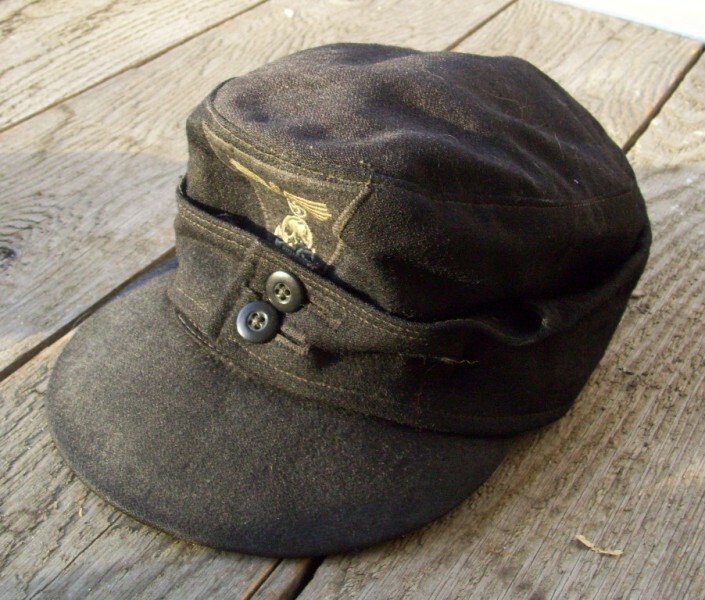 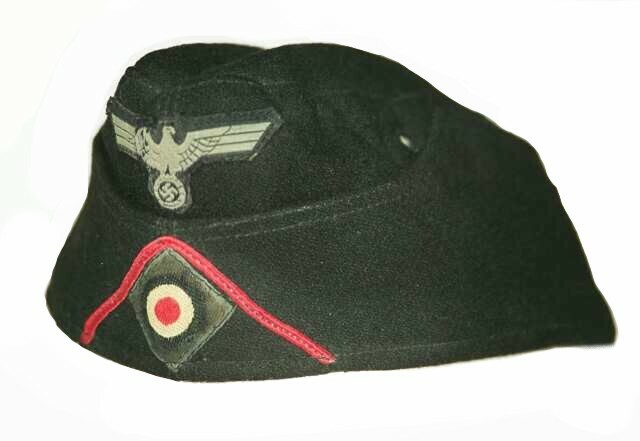 The other head choice is the large peaked Einheitsfeldmütze M43 which again has not only the detail of the SS Totenkopf but the German eagle and button detail on the front of the hat. 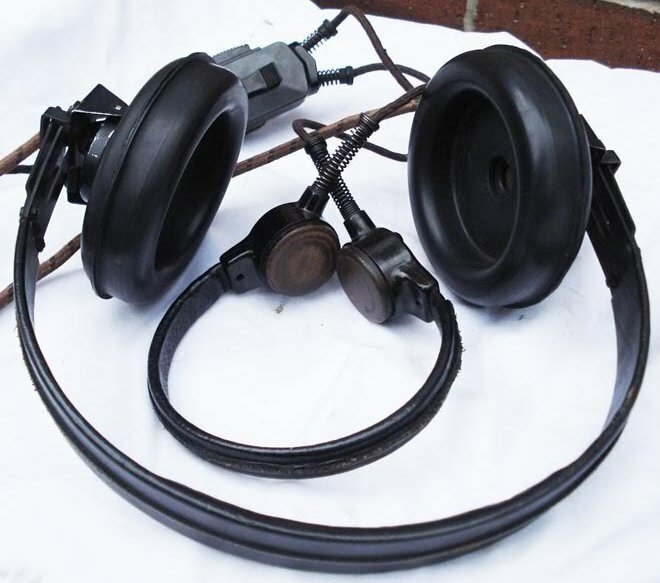 Again he is wearing the large earphone cans which are keeping him in touch with the fellow units in his group as well as the throat-mic. 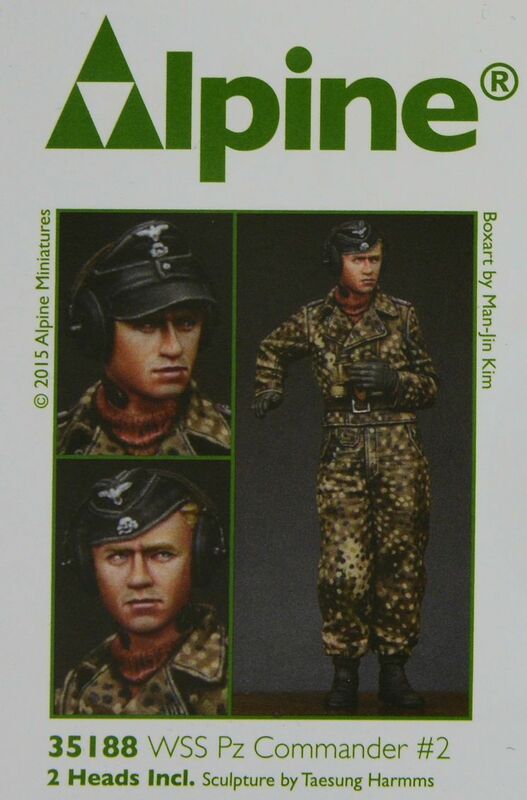 You can see both of these figures from the top down - notice the fine detail on the headgear and hair as well as the officer's pips on the shoulder boards..
And with the flat forage cap.. 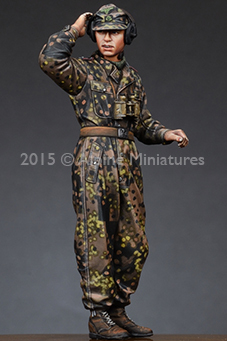 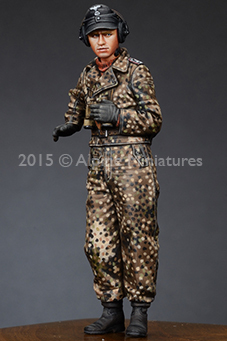 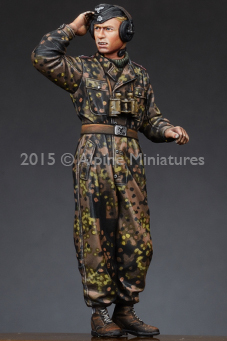 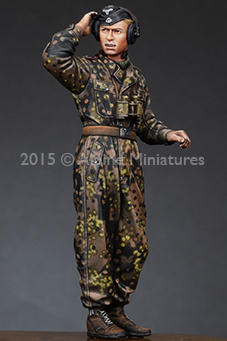 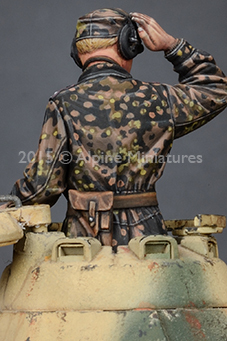 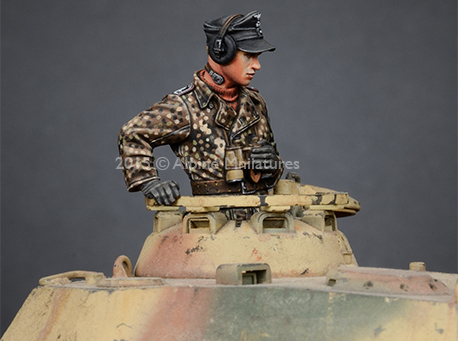 The full body figure of the SS Panzer man is seen here with the first of two head choices – the camouflaged peaked Einheitsfeldmütze M43 is one choice. 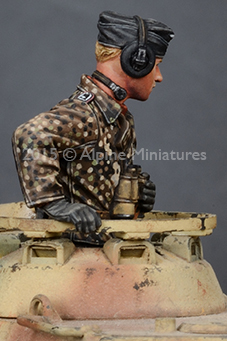 Squashed to the commander’s head by the radio cans on the tanker’s ears and you can see the throat mic on the soldier’s neck as he puts his hand to his ear to better hear the radio chatter. 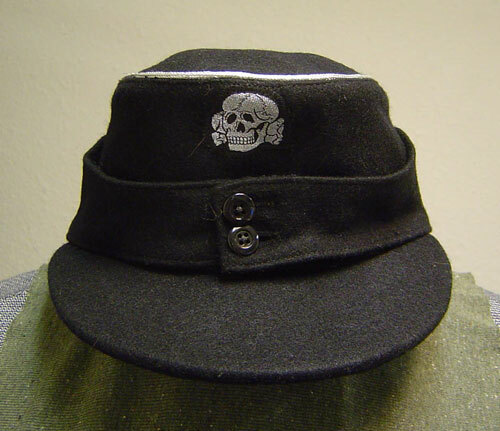 Notice the fine detail on the hair, the skull and crossbones on the hat and piping.. 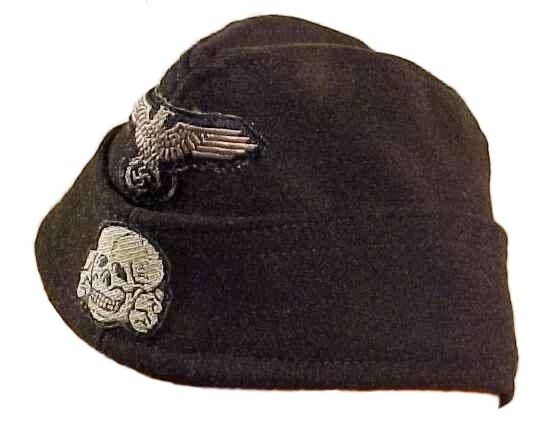 The second head choice features a brimless side cap Feldmütze in panzer black with a prominent SS death’s head emblem and a German eagle on the front. 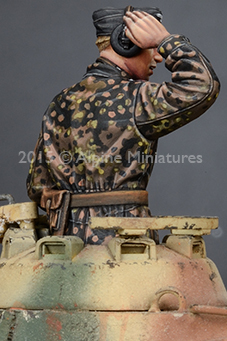 The torso of this figure seems to be wearing German overalls called Panzerkombi with a Plane Tree No.2 camouflage with a brown enlisted man’s belt keeping it all in at the waist. 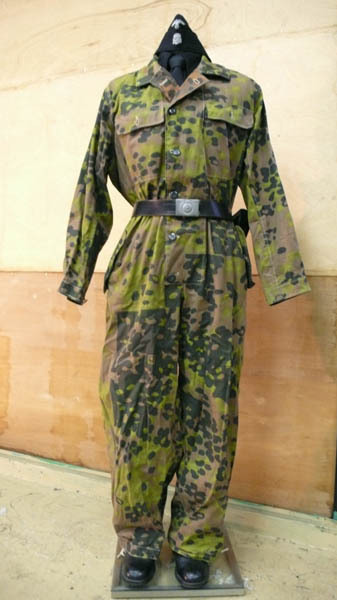 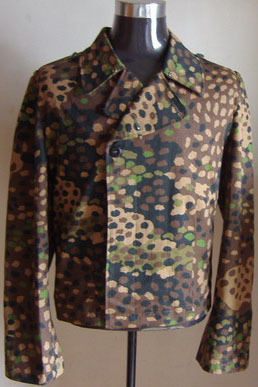 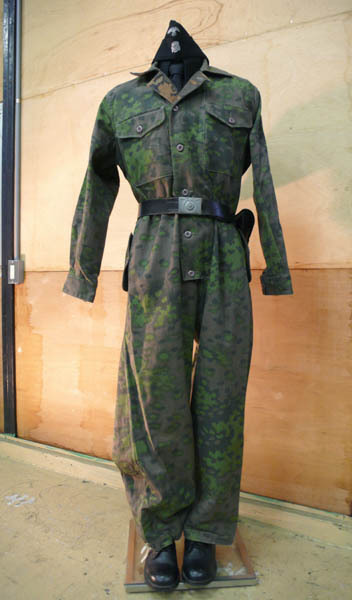 This was a reversible camouflage coverall first issued in 1943 to tank crews as their typical black uniforms failed to provide any camouflage advantage when the men were outside their vehicles. 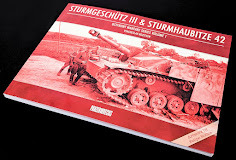 Additionally, it was soon learned that the presence of soldiers in black uniforms alerted the enemy that an armoured unit was in the area. 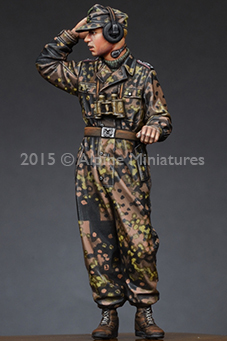 He wears short latter war laced up boots which you can see even the lace detail on – very nice indeed. 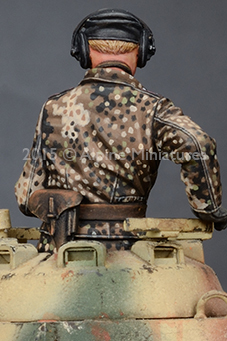 The officer's dual holed belt is the one captured in the figure as well. 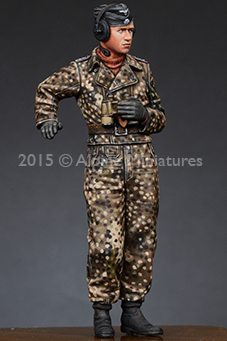 He also sports some small binoculars on his chest and as usual a pistol in a holster in his back right hip. 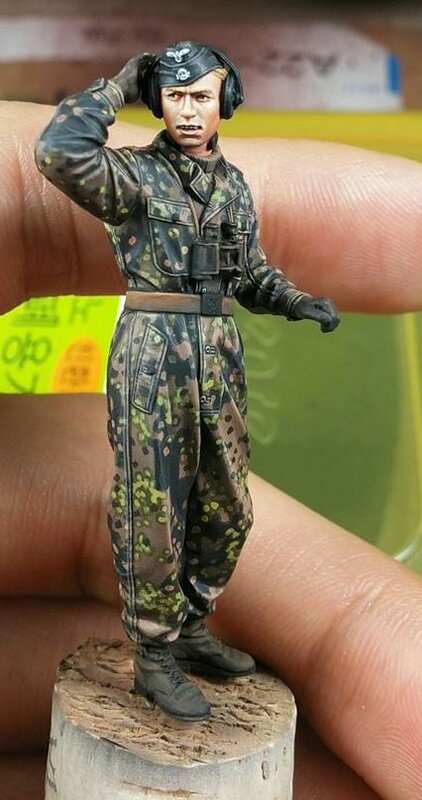 This pistol will be removable if you like. 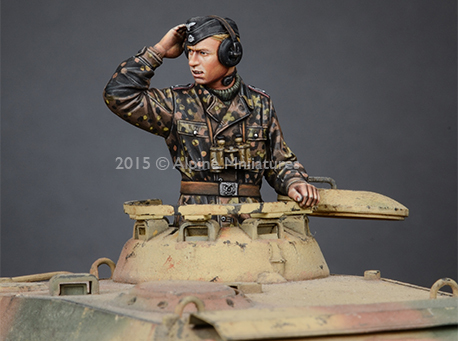 Here he is all put together with both head choices...but first a look at the M43 soft peaked cap choice first from above - so you can better see the fine details and the head's features as well as the detailed collars and sideboards on his shoulders. 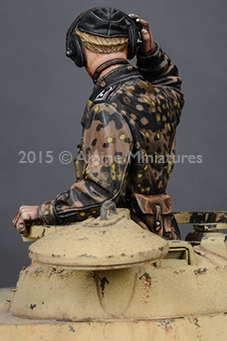 On the box art was a panther but we have them both in a bare donor King Tiger turret together. 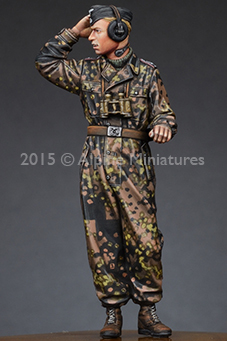 These two commanders – whilst wearing similar outfits are not at all the same. 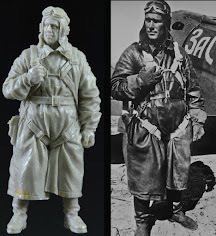 The sculptor has taken the opportunity to keep them looking similar but the subtle differences in books, clothing and hand gestures in body language allow you to use both of these men in the same dio without repeating yourself. 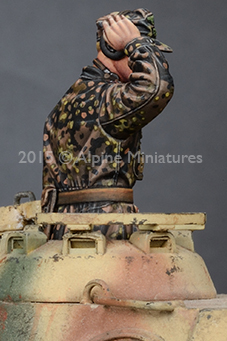 Even though these are two officers I stuck them in the turret of the same tank in several different shots with alternate headgear. 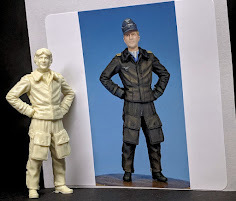 The thing I always seem to notice afresh with Alpine Miniature figures is the engineering of the figures and the body language that makes the figures believable. 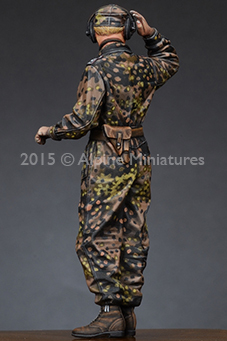 The poses are sometimes a little like a pose but not ever too much. 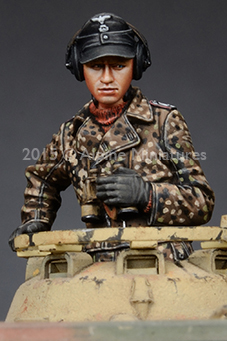 I would say more of a concerned looking set of poses than anything. 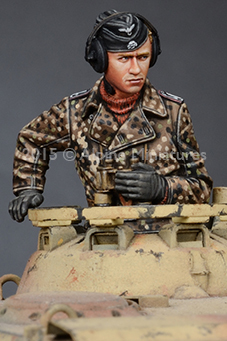 The faces and hair, the pips on the sideboards and the medals on the tanker's chests along with the wonderfully flowing clothing that bunches and scrunches at just the right places. 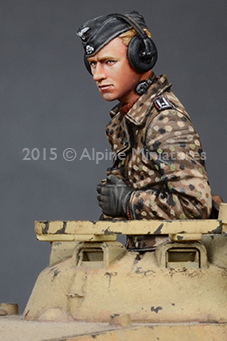 These two figures again prove that Alpine is still at the top of the pack.